This Rebel is ready to yell! The Hammer Rebel Yell features the Rebel core covered with the Juiced Pearl coverstock and is finished out of the box with a 500 then 2000 grit Abralon pad and then polished with Powerhouse Factory Finish Polish. This combination produces a lot of downlane angle when up against medium oil conditions giving you length with a strong backend. This bowling ball is Carbon Fiber Infused! Carbon fiber is one of the toughest materials on earth. Hammer decided to add this material to the inner core of this ball for added strength and durability allowing them to offer an incredible 3 year warranty. Similar Balls: Same Hook Potential, Lane Conditions & Coverstock as the Hammer Rebel Yell. Love this ball. It's my go to ball and I use this about 80% of the time. It handles medium oil and light oil conditions very well. It goes long and has a nice entry angle at the pins. I play down and in off the 5 board and it does an amazing job. It takes out the 7 pin even on a light pocket shot. It's very predictable. 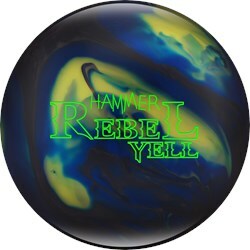 Just when you think there couldn't be a ball better than the OG Rebel......Well here it is, Hammer's New Rebel Yell! This ball is the same shape as OG rebel with more continuation downlane and about 4 to 5 more boards of hook and this baby can pick up on top of the pattern. This is a big skid flid ball. A lot of hook in this price point. I absolutely loved the Rebel and Rebel Solid so I was super excited to hear about this Rebel Yell. The Rebel Yell gives me a lot of room and provides a lot of versatility. My misses right recovered, and my misses left held. 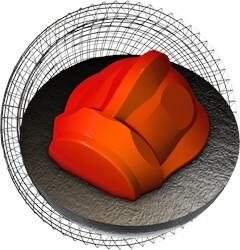 This ball is very controllable and does not lose its energy. For me, the Rebel Yell has a little more overall motion and back end than the Rebel, but is cleaner than the Rebel Solid. It is the perfect fit between the 2 and I firmly believe that this ball can and will compliment anyone. In my personal opinion, I think this ball will be great on house shots or any medium oil conditions. This ball is a great addition to the Rebel line. The original Rebel (blue and red) was very smooth and the Yell gets a much stronger and violent response down lane. Seems a little stronger overall but very aggressive. I used it on the THS, 2011 Women's Open and Broadway patterns and found it to give me a very readable look on what the lane was asking for. Easy ball to figure out and does exactly what this line needed. The 3rd Rebel- The Hammer Rebel Yell! Here are my thoughts about the 3rd edition to the Hammer Rebel line of bowling balls...the Hammer Rebel Yell. The Rebel Yell features the same symmetrical core in previous Rebels. The coverstock used is "juiced pearl". The box finish for the ball is 2000 Abralon with Factory Finish polish. The color is a bright steel/blue/yellow pearl swirl. I am on Hammer staff and my vitals are a 405 rev rate with a PAP of 5 9/16 over and 1/8 up. I have drilled my Rebel Yell with a 45 x 4 ½ x 40 layout, weight hole on PAP and have thrown it at box surface and at 2000 Abralon. I have tried the ball on a variety of THS. I drilled my Rebel Yell with a similar layout to one of my favorite original Rebels which I have had great success on longer sport patterns with medium volume. I find the new Rebel Yell to be a little more angular than the original Rebel likely due to the coverstock difference. I did prefer the ball at 2000 Abralon as that blended out any over/under on the THS. Generally speaking, unless I am bowling on very high friction surface/low volume of oil, I usually dust off at a minimum any factory polish regardless of the ball released. That being said, with the addition of surface, the Rebel Yell had no issues getting around the corner like the original Rebel. This ball is definitely best suited to medium to lighter volumes of oil and depending on layout, can work on a variety of pattern distances. Like with the original Rebel, the Rebel Yell should work for many different styles but I think bowlers with medium ball speeds and/or rev dominant players will really appreciate this new Hammer! See your local pro shop for more information about the Rebel Yell by Hammer! I drilled my Rebel Yell with a 4.5 in below my fingers with CG in the center of my grip. I did not make any surface alterations to the cover. The Rebel Yell glides through the front part of the lane with ease and revs up nicely in the midlane with a strong even move in the backend. I love the shape and how it keeps the pins low with great carry. I would say this ball is about 3 boards stronger than my original Rebel with more pop on the backend. Great ball and a great price point. The Rebel Yell is definitely a piece worth looking at if you are looking for a new ball for Christmas. Super great bowling ball for all house shots ! The Rebel Yell is very smooth and controlable for many different Types of players! It's quite angular off the break point and goes the pins like a hammer !! It will be a great addition to the bag when you need to move left a little and get it to get it to make a motion off the spot ! It won't let you down ! Was able to get and drill this ball with one of my old favorite layouts. With the help of the BLUEPRINT program I saw ball motion from this ball tat i hadn't seen in awhile. Drilled it pin down under my bridge with a cg swing just under 40 degrees. Even with this ball being a pearl i get some good read in the mid lane. Just enough read to set this ball up for an EXPLOSIVE finish through the pins. If your looking for a strong pearl piece with a strong finish look no further. The Rebel YELL is a AWSOME purchase. Very good bang for you buck. If you are looking for a straight ball, we recommend looking at our spare balls. Does this ball have any comparison to the Black Widow Legend? The Black Widow Legend is an Upper Mid Performance ball and will be more aggressive than the Hammer Rebel Yell. Due to the time it takes to produce the Hammer Rebel Yell ball it will ship in immediately. We cannot ship this ball outside the United States.